Carrotmob BC is a group of committed individuals who want to make a difference. With the help of Small Feet Inc, we're greening Vancouver! 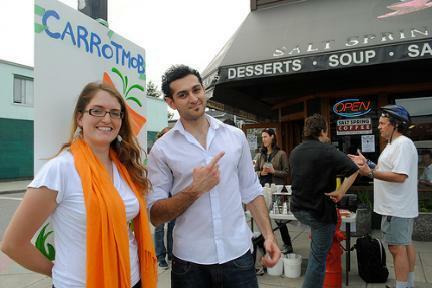 Vancouver's first Carrotmob of the year took place at Salt Spring Coffee on Main Street! We increased revenues over 60%, and generated $1796 (Canadian) towards energy efficiency improvements.